Studio shots, no. 4: George Washington Suggs. George Washington Suggs, commonly known to his white friends as “Uncle Washington” died at his home here in the city yesterday at six o’clock. He was one of the oldest, and most highly respected of our colored citizens. By trade he was a brickmason and plasterer and most of the older houses of the city still bear testimony of his superior skill and honest workmanship. To secure his services was a guarantee of a good job. He was honest, industrious and of sober and law-abiding. He enjoyed the confidence and respect of both races. He took care of his money and wisely invested it in the education of his children and property. As a result he reared and educated a family of two sons and four daughters. One of his sons, D.C. Suggs is at the head of the A. and M. College of Georgia and has been for more than twenty years, while his other son, J.T. Suggs, is a practicing physician in Florence, Ala. All of his daughters are married. Two live here in Wilson, one, Lorena [Serena] is the wife of Dr. E. Moore of Livingstone College, Salisbury, the other lives in Chicago. His funeral takes place from the Trinity A.M.E.Zion church on Sunday afternoon at two o’clock. His many friends, white and colored are cordially invited. The funeral will be preached by Rev. Wm. Coward, pastor of the church and Elder P.D. Gold who has known the deceased nearly all of his life, and was familiar with his good qualities as a man and a citizen will deliver a short address. — Wilson Times, 21 February 1914. Higher tributes could scarcely be paid any man white or colored than were those paid Uncle George Washington Sugg, a colored man of this city who moving here when the town was an infant has left a shining example of what industry and thrift, generous instincts and motives progressiveness and correct living and a life devoted to the uplift of his people, would bring in the way of heartfelt eulogies at his departure. The man in the north and west who does not understand the kindly relations existing between the white man and the black man in the south, would probably have been surprised to have seen representative white and colored citizens mingling their tears together with their tributes at the bier of Uncle George Washington Sugg whose memory we all delight to honor, for his life in his sphere of activity has been all that could be asked of any man, and in order to set aside any superficial ideas resting upon the minds of those who are not informed, we regret they could not have witnessed the scene presented yesterday afternoon. Rev. Cowan, pastor of the A.M.E.Zion church opened the services by asking Elder P.D. Gold to read the 90th Psalm. He did so [illegible] that tradition says that Moses wrote this psalm while Israelites were sojourning in the wilderness and to the vision of Moses there seemed to be nothing tangible and his life work had been thrown away, and yet in the purpose of God all things are known. It is not for us to reason or to question why, it it for us to remain in our places and do our part and the blessing always comes. Then followed appropriate resolutions from the church read by a member of the committee. Rev. Cowan then read a sketch of the life of the deceased. His worth as a citizen, his activity as a trustee of the colored school, his help to his race generally. It stated that he moved here in 1868 before the county was able to support a school and became personally responsible for the salary of J.C. Price, who conducted a school here for the colored people. Elder Gold was then asked to speak and state that he was glad to see such an interest manifested in the funeral of a man who in honoring you yourselves honor. I have known him for 50 years and always esteemed him. That he has reared a family of children well raised and properly tutored who have distinguished themselves in the world is a credit to him if he has done nothing else. A man joined with Jesus Christ has enough. His conduct will be good, his deportment good and he will be found striving to do right and when he goes hence he will received the reward that remains to those of the redeemed. Rev. Cowan then delivered an eloquent funeral address and at its close called upon Hon. John E. Woodard who complimented the pastor upon what he had so well said. Mr. Woodard stated that he deemed this a melancholy pleasure to say a word over the bier of a man who had been his friend and a true friend to his race. He had known him 35 years as a distinct type of a man, a man who easily passed from the state of slavery to that of a citizen with the right ideas in his head and ideals in his mind as to the duties of citizenship. He gave to his people better opportunities than he had enjoyed. It was his pleasure to do so. He invested his wages for their good. He has reaped a noble harvest in the children he gives to his country and in the regard he has left in the hearts of the countrymen. Prof. J.D. Reid followed in a laudation of the deceased as a promoter and supporter of the schools. He visited the schools and encouraged the children. Prof. S.H. Vick delivered a beautiful eulogy and glowing tribute and Rev. Taylor of Calvary Presbyterian church also added a word to the many fine tributes that had been paid. The exercises were interspersed with hymns and solos, and the large audience viewed the remains which were laid to rest by the Masons, of which he was an honored member. — Wilson Times, 24 February 1914. Death certificate of G.W. Suggs. 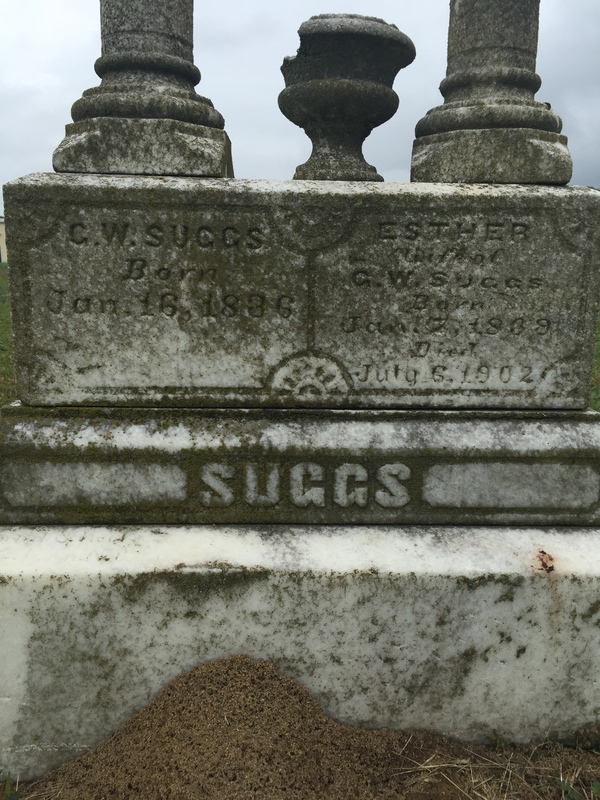 George W. Suggs, son of Lou and Julia Bess Suggs, was buried in the Masonic cemetery next to his wife, Esther. Their double headstone, now broken, once stood as one of the most impressive in the burial ground. G.W. Suggs died intestate. (There is confusion about whether his surname carried a terminal “s.”) Letters of Administration issued in his estate named as heirs his children D.C. Sugg, Jas. T. Sugg, Serena Moore, Julia Bryant, Edmonia Purrington and Mollie Watson. 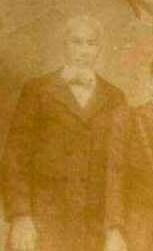 Photo of Suggs courtesy of user JamesKennedy621 at http://www.ancestry.com. 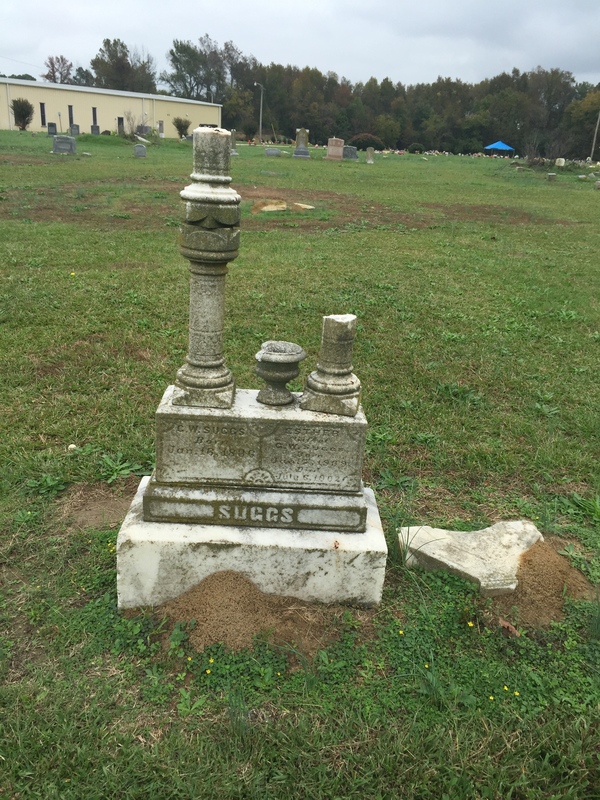 Photo of grave taken November 2015 by Lisa Y. Henderson. Administrators Bonds, Wilson County Superior Court, North Carolina Wills and Probate Records, 1665-1998 [database on-line], http://www.ancestry.com. ← The finest game of ball ever played. I hope this isn’t the end of Black Wide-Awake. I found your information so informative, and I really enjoyed reading about Wilson. The people, the events, the city 100 years ago, was extremely enlighting. I see this was not a rural city and was very progressive for that time. Please post more, if possible. By no means! I’ve got 30+ posts in the draft queue right now. It’s just been a hectic week, and the main ones I’m working on require a lot of annotation.